We were very excited about NASA’s recent discovery of organic matter on Mars, stronger evidence than we have ever had of the presence of life in the red planet’s history, and perhaps even now. And sure, that life is nothing more complex than a light dusting of bacteria, but it’s hope for a future off-world, and even more incredible, it cements the notion of alien life. That’s life within our own solar system, so it’s no Faster-Than-Light travelling alien sapience that look like somebody’s been gradually improving the same sloppy prosthetics job over the last couple of decades, but it’s a start. Space… the final frontier, and like any untamed wilderness there are always struggles and conflicts for the resources and strategic advantages they might offer. While the physics, tactics, and possibilities offered by all out space-combat might go under utilised and appreciated in modern media, there’s one thing we can do in film, TV, and games, and that’s make it look epic! Though the loss of life may be tremendous, and the horrors of war are made even more heartbreaking when the fallen are cast adrift in the endless dark… but damn it looks pretty! Here’s the Top 10 Space Battles. There is something intensely beautiful about Babylon 5, despite the age and the increasingly dated characters. It has an aesthetic of its own that sets it apart from any science fiction before or since, and perhaps that’s in the design of the universe, the uniqueness of every race and their diversity, perhaps it’s in the epic musical score that underlies those moments of intense action or dramatic importance. Personally, I think it could be the philosophies and views espoused in the series, both subtly and overtly. There is a scene in the episode “There, All Honour Lies”, very brief, in which Kosh is teaching Sheridan lessons that he will need to win a war of minds with the most powerful military forces in the galaxy. 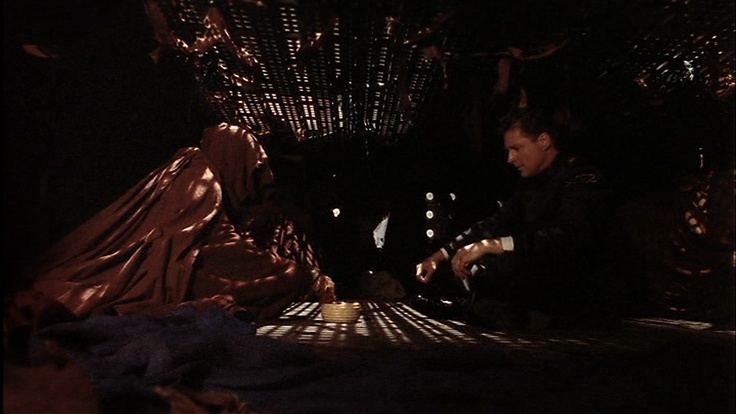 In the lesson, Sheridan is ushered into a dark place of the lowest part of the station, crawling on his hands and knees where he is greeted by a hunched and faceless figure who sits in silence until given something. Sheridan carries no cash, but instead places the metal bar that denotes him as command staff into the beggars bowl. As soon as he does, the dark chamber comes alive with shrouded figures identical to the beggar, singing in one angelic voice as the angelic Vorlon stands outside, entranced. One moment of perfect beauty. The inquisitor sent by the Vorlons to “test” Delenn and Sheridan asks one question, over and over, “Who are you?“. Names, ranks, titles, none of them are the right answer, and he inflicts pain and suffering until both of them acknowledge that as individuals they are meaningless, but that their role stands for something. It is not long after this moment that the actions of Earth cause the crew to denounce and declare independence from Earth, and symbolically shed their uniforms, replaced by a blank uniform devoid of symbols. Sheridan offering up his command bar builds upon that image. By taking away his symbol of command he takes a step towards humility, making himself more equal to the humble surroundings, connecting to them and appreciating them. In removing a label given to him by others he becomes more his own man, allowing him to define himself. Every step takes him away from a faction and makes him a part of the greater whole. You witness the moment of revelation on his face – kudos to Bruce Boxleitner for that subtle moment – and he embraces a new enthusiasm from that moment on. Much like when he visits G’Kar in his telepathic fugue, Kosh offers another lesson of light in places of shadow, hope in the midst of despair. Desperation causes us to resort to incredible measures, but a moment of clarity when the universe is crashing down around your ears is the only way to resolve the worst of situations. On their way down to the choir, Sheridan makes an off-hand comment about how Security Chief Garibaldi would go mad if they found them down in Brown Sector he’d go mad, just to impress how dangerous that part of the station is as a last-minute exaggeration before that singular moment of perfection. Kosh lays the groundwork for a moment that comes later, for which a minor spoiler alert is in order – At Z’ah’adum, when Sheridan plummets to his death he is found by Lorien the First One, who encourages him to give in to the darkness utterly, to stop struggling and clinging to life and simply die, or else he could not be resurrected. Would Sheridan have simply lay down and died without the lesson, or would he have fought on, ultimately dooming himself and the galaxy in the process? Incomplete, but sufficient for now. The Christ comparison is easy to make, a saviour who dies and is reborn, nice and easy, but Puer Natus Nobis Est never mentions the name. Sheridan bears the woes of his government while facing down a great darkness, but would also come to be the highest authority in the galaxy as head of the Interstellar Alliance. The Angel of Great Counsel could refer to Sheridan’s power to resolve more with words and advice than with application of military force. I’d be open to other opinions on the choice of song. It’s not enough to merely dismiss it as a beautiful chant and a comparison to a saviour character, the use of Peur Natus has relevance, for which I am open to debate, please join me in the comments or over on our Facebook page. I would challenge anyone to watch this particular moment in Babylon 5 and draw their own conclusions. It is beautiful, poignant, and not discussed nearly enough. Religious themes run through Babylon 5 like veins, angels and demons, faustian bargains, prolonged discussions on the nature of the soul and gods, but it’s no mere battle of good vs evil. Even the character you might believe farthest fallen shows himself capable of redemption, and his most bitter and vengeful enemy manages to forgive him. Now to start going deeper. Last week I discussed the alien races of Babylon 5, similarities and differences and how we’re not all that great at coming up with wholly alien life forms. Everything we create has some irrevocable grounding in what we are and what we know, and while a lot of that has a solid basis in evolutionary biology we’re still missing a little imagination at times. What makes something alien? And how can we create something wholly alien when we create from such terrestrial experiences? It is absolutely true to say that we write what we know, and no fantasy or sci-fi can create something utterly beyond our knowledge and comprehension because… well how would we write it? Can the viewer or reader invest emotionally in an alien that conforms to nothing terrestrial? To say nothing on the subject of makeup and special effects budgets. It’s one of those little facts that’s easily forgotten about Star Wars that in early edits before cinematic release that old dogfight footage was used in place of the actual space battles until decent special effects could be put into place. This translated to the X-Wings and Tie Fighters taking great swooping loops and arcs to follow one another, and the same can be said of the Enterprise vessels in Star Trek, along with the many others who mimic the same style. The gates of Babylon 5 opening places humanity firmly in the middle of the space-faring races. No longer completely green around the gills, they’ve helped topple one mad genocidal force, narrowly avoided genocide in mysterious circumstances, and are now seeking to help forge peace among the disparate races and factions of the galaxy.